What I got back was mainly snickers and sneers as they told me that while that might be useful information, the reality was that too many people needed to be ‘fixed’ now and that was more important. But I persisted because while I was willing to admit that people needed help—I also said “Unless we add this other side of the equation—we’ll end up with a ‘fix it after it’s broke system’ as the only option to help people.” And that didn’t make any sense to me. And that’s exactly what has happened. Today, 15.5 million people are taking anti-depressants. Mental health has developed itself into a disease/ disorder and a fix it after it’s broke system. Millions of people are walking into a system expecting to be helped without realizing that mostly that system is interested in reducing symptoms and problems. Few of the professionals who have been trained in this mainstream system have anything more than the most rudimentary knowledge of Wholeness—if even that. But I never gave up on the idea of helping people learn how to create whole lives as the basis for the work I did as a counselor and coach. At the least, if someone was having a problem—I wanted to help them deal with it in such a way that the long-term outcome was wholeness and a vibrant life and NOT simply symptom reduction. Once I realized that the mainstream system was not going to focus on teaching professionals how to help clients build whole lives, I set off on my own to discover how to do that. I spent the next 10 years learning a wide-variety of information that honored the physical, emotional, thinking, sexual and spiritual aspects of wholeness while applying it in real life, day-to-day terms. The result is the Life Puzzle model. It is a practical framework for building wholeness. To learn more, click on the “What is the Life Puzzle” section. You have a choice today. You can accept the mainstream mental health system and focus on removing the immediate ‘problem’ you have whether it is depression, anxiety, whatever. You’ll likely receive a prescription and experience symptom relief and that may be more than enough for you. Or you can step back and look at what’s going on in your life right now and decide to go past symptom relief and head towards Wholeness. I can’t tell you what the right choice is, but I can pretty much guarantee that if you choose Wholeness—in the long run you’ll have a much more vibrant, full life. So, if you’re intrigued, continue to explore the site. 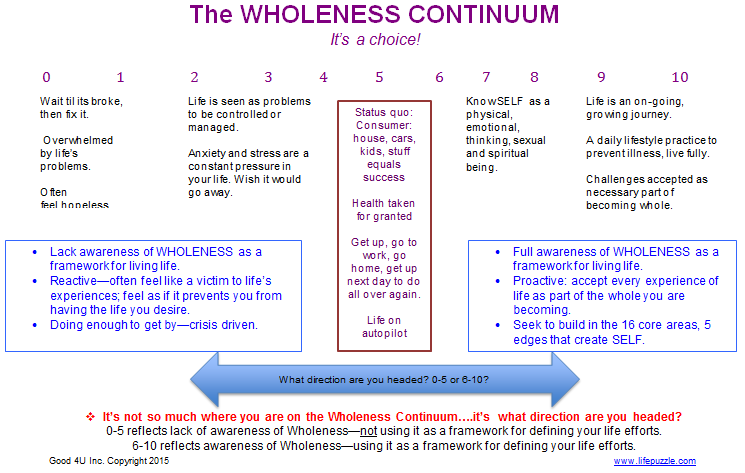 You’ll be introduced to Wholeness and the Life Puzzle model we use as the framework for wholeness. Soon there will be an online school where you can take simple, short but effective courses in how to build your Life Puzzle and end up with wholeness being the foundation on which you design your life. There are books, blogs and recommendations of other places you can go as you actively work towards Wholeness as the outcome of your efforts in dealing with life’s challenges!